esterday we wrote rather quickly — if not prematurely — about ISO's preparation for dismissal of complaints. It is in ISO’s interests — however selfish they may seem — to carry on pretending that nothing wrong has happened. Following the early leaks (among other less flattering ones), there is some press coverage that presents the situation. Ah, here we are back in 2007, in the good old summer 2007 where everything for the ISO was fine. Everything works just fine, there’s nothing to see, so mind your own business folks. Worldwide fraud, four appeals for a standard that has “been conducted in conformity with the ISO/IEC JTC 1 Directives” pressures on governments standards bodies, one investigation on OOXML led by the European Commission… and appeals “should not be processed further”? Somehow I think we have missed one thing or two with the ISO. I don’t exactly know what it is we missed. Perhaps it was a better understanding of how they work. Perhaps it was money. Perhaps it was just all about taking them out for a walk and show them the world before they all got brainwashed. As expected, there’s a reasonable side that complains about the well-documented abuses of the process, but on the other side, there are those who are Microsoft-sympathetic or Microsoft partners (i.e. they make profit from this abuse). To them, absolute Microsoft lock-in and GPL exclusion as ‘standard’ actually means money. Either way, this seems like the type of situation where it makes perfect sense for different NBs that are aware that they share common concerns to talk to each other, and even share drafts. Why not? Wouldn’t that make things easier for all concerned in the process, if they can reach consensus on their concerns before they request action? I’m not sure why you would see anything inappropriate here, and your take seems inconsistent with prior statements you’ve made. After reading the pdf document, my feeling is the system is in a mess. 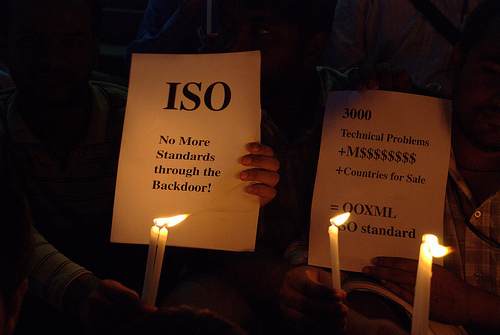 We dont need them anymore….bye bye ISO. “fast-track” was the weak link of the entire affair. To fix this, governments should refuse fast-tracked standards, unless there is a consensus. OOXML remains extremly controversial even now. OOXML is to open standards what Israel is to peace in the middle east. Thanks, I agree wholeheartedly and I took note of your latest post which I’ll mention later.